The new TATULA 150 T-WING BAITCASTING SERIES is designed for specific bass fishing tasks like deep cranking, punching or flipping, pulling chatter baits or swimbaits, and frogging. With an aluminum side plate and frame and reinforced brass gearing and a sturdy pinion gear, these reels are designed for the more rigorous demands of power bass fishing. 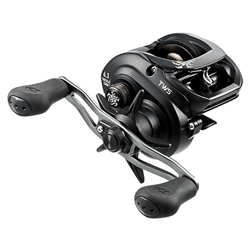 The T-WING level wind system allows line to pay out freely on casts and flips increasing distance and accuracy. The reel is Cadillac smooth utilizing an astounding 7 ball bearings and 1 roller bearing. Each reel sports a left or right side retrieve. A 100mm swept handle delivers hours of comfort. As if performance was not enough, the matte black finish and spider graphic make for one of the most attractive reels on the market. If you covet the tools of the successful power bass fisherman, than step up to the plate and make the TATULA 150 T-WING BAITCASTING REELS an important part of your largemouth bass arsenal.